The scheduled public comment period for the July 26 Seneca Healthcare District (SHD) board meeting had to be rescheduled and moved to a larger venue due to the large number of people that came to comment and ask questions of the board. An estimated 40 to 45 locals filled the hospital conference room and an overflow area the hospital had set aside in an attempt to accommodate the large group. From the statements of the first two or three public speakers it was apparent that most of those attending were at the meeting to address some questionable information that had been posted on social media pages regarding the possible departure of one of the doctors, not to hear the business related items on the agenda. With the cramped quarters and some audio issues with the “live stream” system to the annex area, it was soon apparent that extra space and more time was needed to do justice to the folks attending. District 3 Supervisor Sherri Thrall offered to arrange for the availability of the Almanor Recreation and Park District facility and the board promptly voted to have an additional town hall public comment period Tuesday, July 31, and continue with the regular agenda items. With the announcement of the additional meeting on July 31, a majority of the public opted to not to stay for the rest of the board meeting. During the regular business meeting, the board listened to department reports, policy reviews, financial reports and the proposed Operating Budget for the 2018-19 Fiscal Year. After numerous questions to CFO Steve Boline and discussion by the board, an operating budget of $16,832,090 with an anticipated net income of $1,732,245 was accepted on a three to one vote, with Rich Rydell, Dr. David Walls and Dana Seandel voting yes and Jerri Nielsen voting no and Ken Crandall absent. The board also approved the purchase of new computer servers and a computer reconfiguration project that will significantly increase the capabilities and speed of the hospital system, which in turn will help medical staff as they contend with meeting government electronic health record requirements. The cost for the hardware and reconfiguration will total just over $145,000. The board also discussed recruitment of doctors, possible compensation packages and contracts in an attempt to give guidance to CEO Linda Wagner and HR staff in their continued quest to bring new providers to the hospital. The SHD board reconvened Tuesday, July 31, and the choice of a larger venue was decidedly a wise choice. 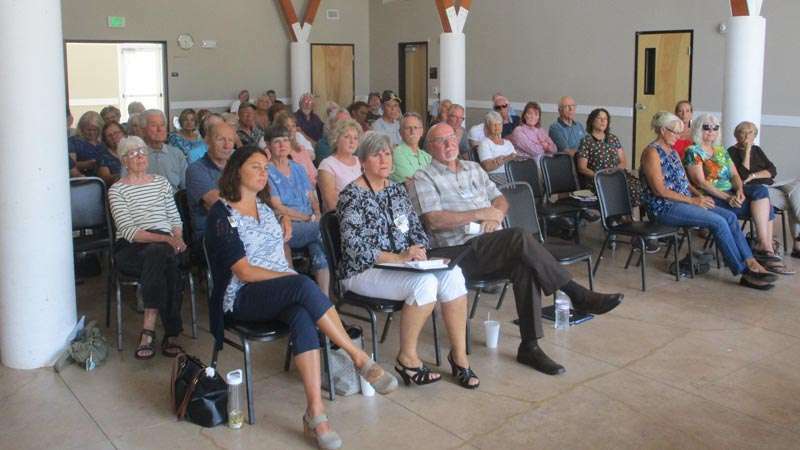 About 50 Lake Almanor area residents came to the recreation building looking for answers and expressing support for Dr. Nellie Salehi after a rumor started that she was leaving the area. There were abundant questions regarding how to access information from the hospital, how to quell misinformation posts on social media, the possibility of some evening board meetings and what is being planned for the future of the hospital. Seneca CEO Linda Wagner and members of the board shared answering the questions. Board meeting minutes and financial reports are available on the website at senecahospital.org. For those without internet access, contact the hospital administration office at 258-2067 and ask to be put on the board information distribution list. The hospital has redistributed a copy of the SHD social media policy to all employees, medical staff and board of directors. Part of that policy indicates that all persons associated with the hospital should try to present a positive image when representing the hospital. The board expressed hope that increased communication and information access would decrease the desire for evening meetings due to the substantial staff scheduling changes required for them. They agreed to a trial run and see how many people actually showed up and to see if it was feasible to do on a regular basis. Wagner responded to the question about the hospital’s future. There is currently a Strategic Planning Committee that has been meeting for several months and she personally invited anyone interested in helping on that committee to contact the administration office for more information. Seneca Hospital is and has been an integral part of the Lake Almanor Basin for many years and is vital to the community. Both the board and staff expressed excitement at the support and interest shown by those attending the townhall and the hope is that the community as a whole will become more aware of true value and services that are being offered. There seems to be a lot of dubious information floating around, much of which was debunked at the townhall meeting. As a resident of the community served by Seneca Hospital, the only way to discover the real value and quality of the hospital is to be personally engaged and not rely on others to tell you what is happening.